1988-89 O-Pee-Chee Hockey is another in a long list of impressive sets made by the Canadian card maker during the 1980s. A memorable design and a strong rookie class make it one of the decade's best. Like a lot of sets, 1988-89 O-Pee-Chee Hockey closely mirrors the Topps set from the same year. In fact, the first 198 cards are identical. However, the Canadian version continues on to 264 total cards. 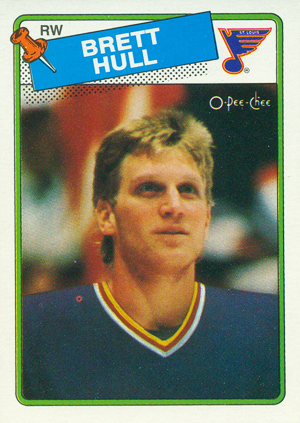 The checklist is led by Brett Hull's rookie card. One of the game's greatest all-time goal scorers, Hull's rookie has remained a collector favorite ever since he broke through in the early 1990s. Other key rookies in the set include Brendan Shanahan, Pierre Turgeon, Joe Nieuwendyk and Bob Probert. Wayne Gretzky is also pictured for the first time as a member of the Los Angeles Kings. 1988-89 O-Pee-Chee Hockey is sometimes called the "pushpin" set because of its design. Card fronts have a white border and a color frame. Most of the inner frame contains the player photo. The top portion is white in the background. On the right is a team logo. The left has a diagonal plate with the player's name. This plate has a pushpin over top to give it bulletin board sort of feel. Above the plate is the player's position. Card backs are vertical with an orange background. The design is fairly standard with vital player info at the top followed by career statistics. Some cards also have short biographies. Although more available than some of the company's other hockey sets released earlier in the decade, 1988-89 O-Pee-Chee Hockey still doesn't suffer from massive overproduction. As a result, values have held relatively well over the years.